March 31 marks the 175th anniversary of the birth of one of Scotland’s most prolific and versatile writers, Andrew Lang (1844-1912). 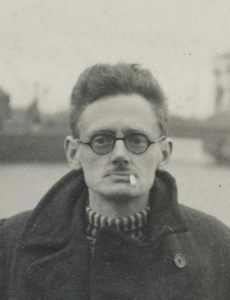 The author or co-author of 249 volumes, Lang worked in fields as varied as anthropology, folklore, classical scholarship, Scottish history, poetry, drama, and children’s writing. As a perennially in-demand journalist, he also penned articles and reviews on an almost daily basis. 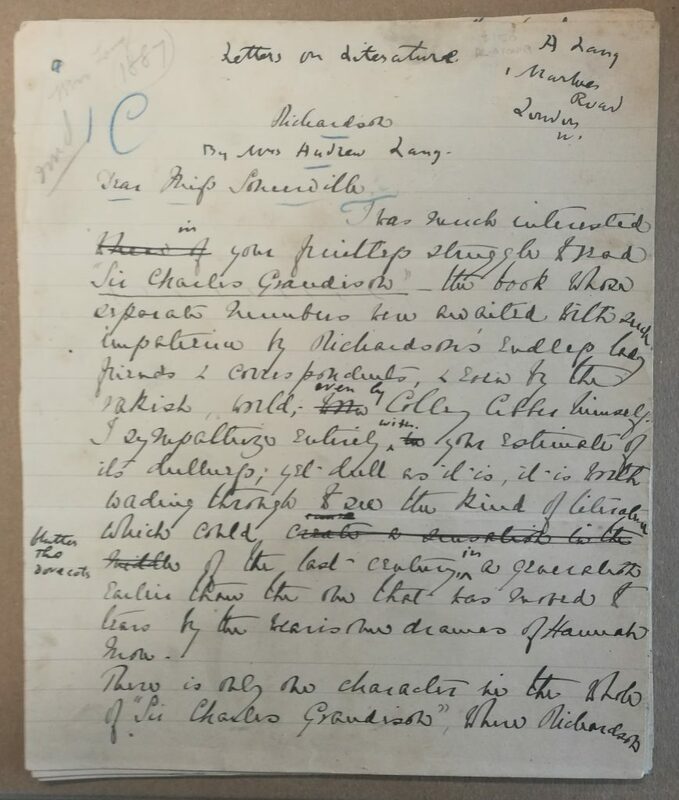 At the Centre for Research Collections, we hold a suitably diverse collection of 35 letters (Coll-732) from Andrew Lang to a number of literary and professional colleagues. The publications mentioned in these letters convey the full breadth of Lang’s interests: controversially pro-Jacobite studies of Mary Queen of Scots and Charles Edward Stuart, translations from Homer, an epic poem on Helen of Troy, a history of Oxford University, a study of three French Romantic poets, and anthologies of ballads and folktales. 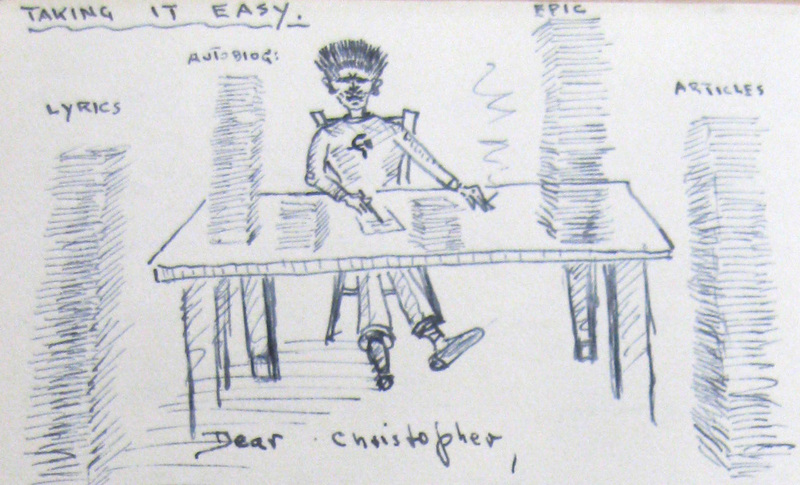 Although many of the letters are brief and business-like, they provide a vivid glimpse into the daily labour of a Late Victorian professional writer. 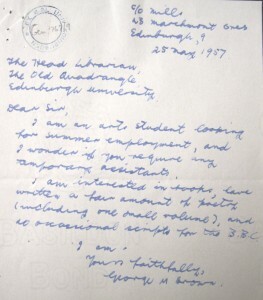 There are letters asking magazine editors what they pay contributors; thanking his literary agent Hughes Massie for a cheque; requesting transcripts of historical manuscripts held by the British Museum; offering advice to young authors; submitting work on behalf of protégés; accepting or declining invitations to address clubs and societies; and turning down commissions when over-committed or short of inspiration. While few of Lang’s correspondents are well-known today, there are references to distinguished literary friends. 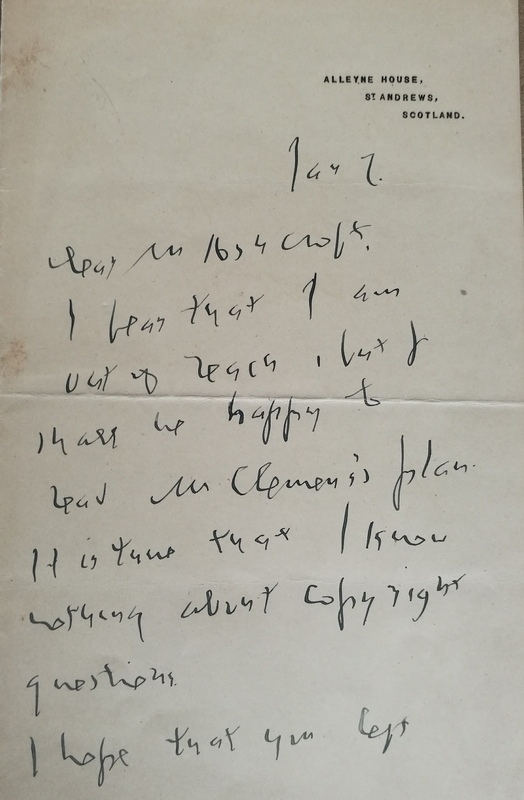 Lang writes to W. E. Henley that he is ‘delighted’ with the idea of Robert Louis Stevenson’s ‘voyage and travails with the Cuddy’, i.e. his Travels with a Donkey in the Cévennes. 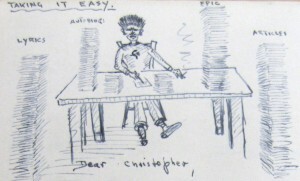 In a letter to Mark Twain’s business manager Ralph W. Ashcroft, Lang expresses his readiness to hear more of a publishing plan proposed by Twain (to whom Lang refers as ‘Mr Clemens’, the writer’s real name). 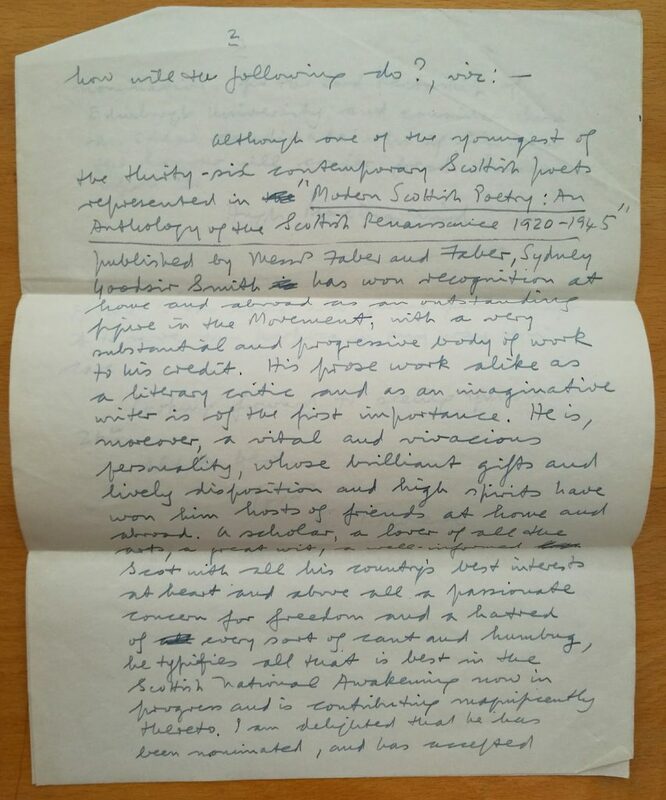 There is further evidence of Lang’s transatlantic interests in a letter accompanying a submission to the American children’s magazine The Youth’s Companion, in which Lang begs the editor to return his article if he judges it to be ‘of a corrupting tendency’. Today, Lang is probably best-known for the twelve ‘Coloured’ Fairy Books that he edited with his wife Leonora Blanche Alleyne (1851-1933). These were anthologies of traditional tales from around the world, each distinguished by the colour of its binding. 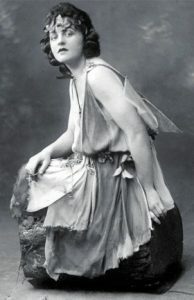 Lang was initially chief editor and wrote prefaces for the entire series, but Leonora gradually assumed editorial responsibility, and, with a team of co-writers, did most of the translating and retelling of the stories. Although the extent of Leonora’s contribution is clearly acknowledged in Lang’s prefaces, the series is often wrongly called simply ‘Andrew Lang’s Fairy Books’. The Langs are now credited with overturning the Victorian assumption that fairy-tales were unsuitable for children and undeserving of serious critical attention. 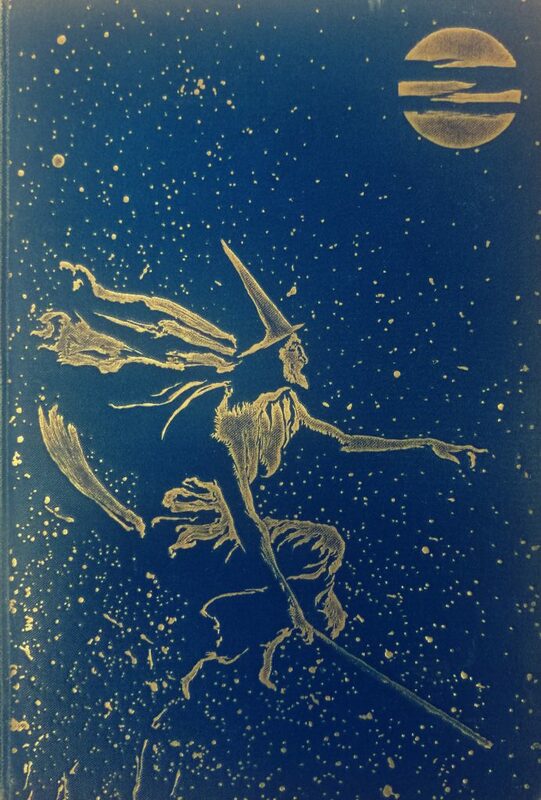 There are no unambiguous references to the Fairy Books in our collection of Lang letters, but the CRC holds some fine examples of the series in our Peter Freshwater Collection, with their distinctive cover illustrations by Henry Justice Ford. 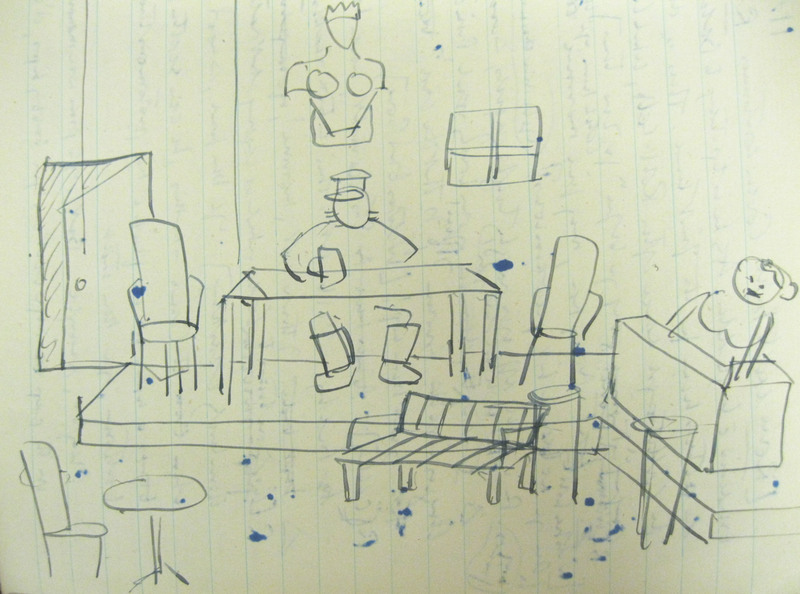 A recent archival purchase provides further evidence of collaboration between Andrew and Leonora Lang. We now own the manuscript of a chapter on novelist Henry Fielding that Leonora contributed to Lang’s volume Letters on Literature (1889). 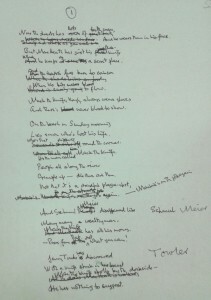 There are MS corrections and additions in Andrew Lang’s hand, together with a final paragraph of his own composition. 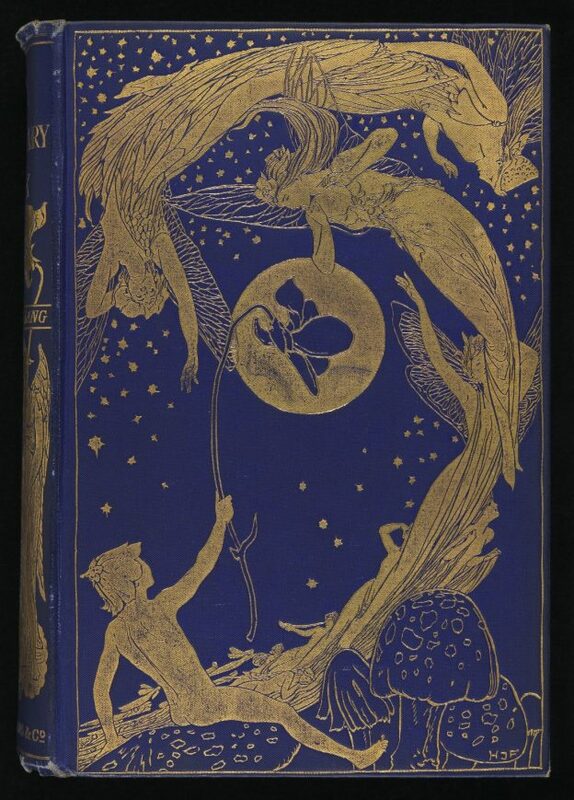 This entry was posted in Collections, Library, Personal Papers, Scottish Literary Collections and tagged Andrew Lang, Fairy Books, Leonora Blanche Alleyne, Scottish Literature on 29/03/2019 by pbarnaby. Today, at the Hermitage of Braid, Principal Peter Mathieson will unveil a plaque commemorating Edinburgh University’s first Nobel Prize winner, physicist Charles Glover Barkla (1877–1944). Barkla is one of a dozen figures being honoured in this year’s round of Historic Environment Scotland’s Commemorative Plaque Scheme. The plaque will be mounted at Barkla’s former home of Braidwood, which is currently the Visitors Centre for the Hermitage of Braid Nature Reserve. Born in Widnes, Lancashire, Barkla studied at University College Liverpool, and occupied a number of academic posts in Cambridge, London, and Liverpool, before being appointed to Edinburgh University’s Chair of Natural Philosophy (Physics) in 1913. He held the chair until his death in 1944, playing a prominent role in instituting honours degrees in pure science and developing the honours school of physics. Barkla was awarded the 1917 Nobel Prize for Physics for his ground-breaking work with X-rays. Barkla conducted experiments that demonstrated that X-rays could be partially polarized, thereby proving that they were a form of transverse electromagnetic radiation with properties similar to light. 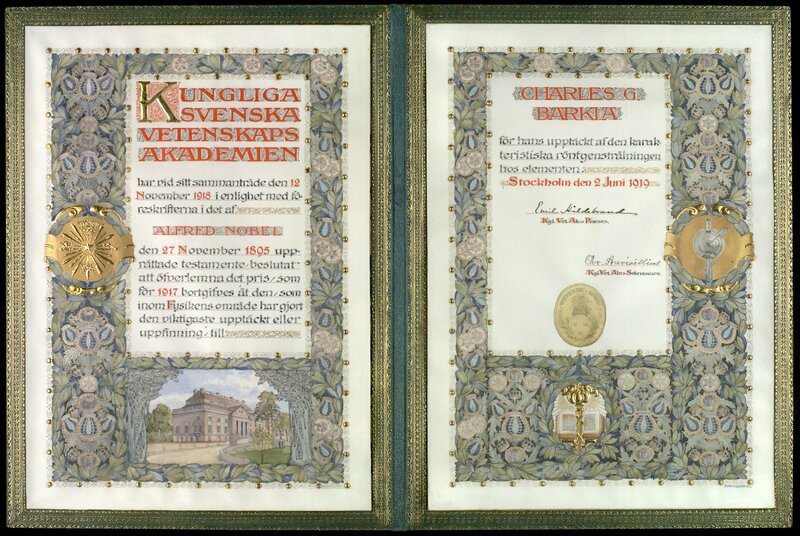 With the First World War still raging, the announcement of the 1917 Nobel Prize was delayed until 12 November 1918. Barkla’s Nobel Banquet was held on 1 June 1920, and he gave his Nobel Lecture on 3 June 1920. 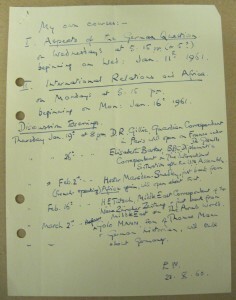 Edinburgh University Archives hold Barkla’s Nobel Prize citation (E96.23; see images below), together with a collection of congratulatory letters and telegrams from fellow scientists (E96.10). 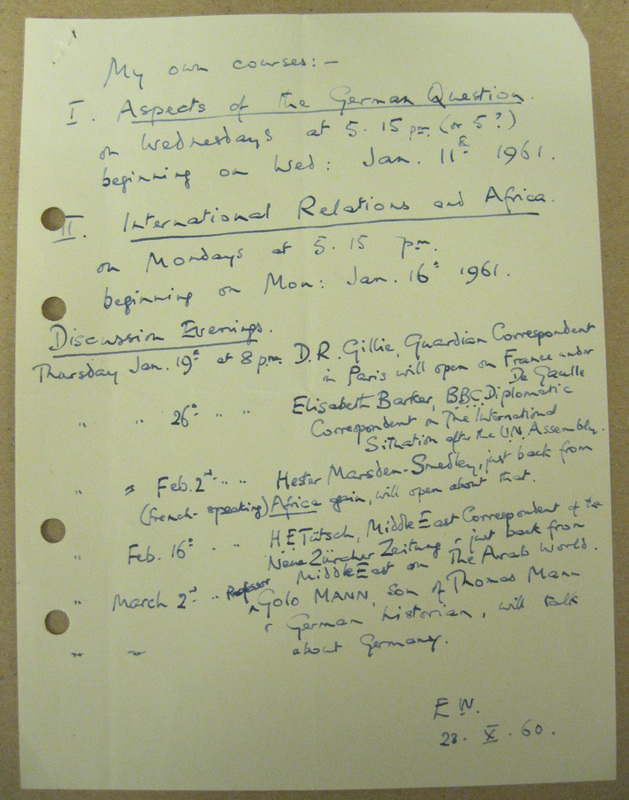 Our Barkla Papers (Coll-296) also contain lectures and lecture notes (E91.105). 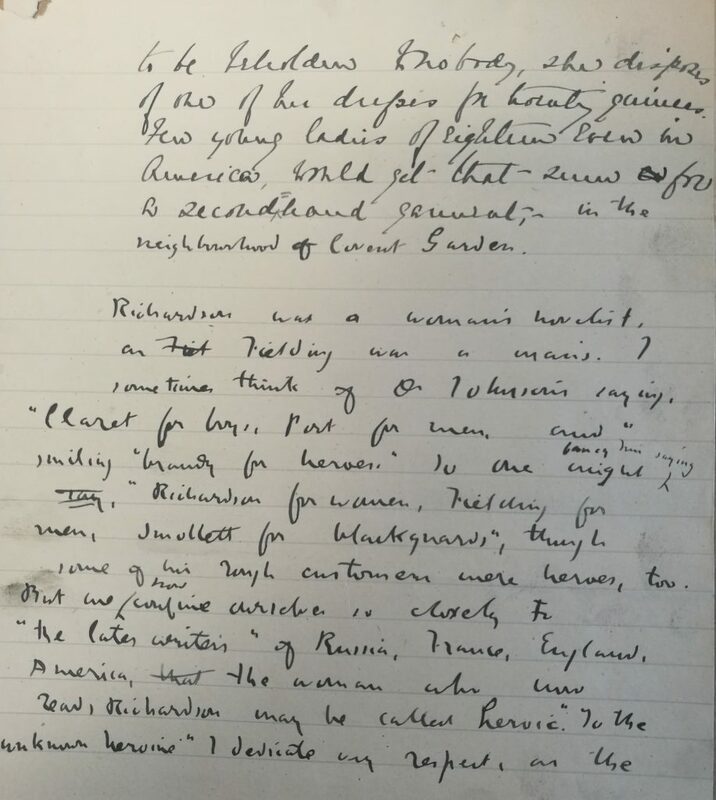 This entry was posted in Collections, Library, staff and tagged Charles Glover Barkla, Hermitage of Braid, Nobel Prize on 12/06/2018 by pbarnaby. In 1951, students voting for a new Rector of Edinburgh University faced a choice between a quite extraordinary range of candidates. The election of actor Alistair Sym in 1948 had put an end to a long tradition of electing career politicians or military men. This time, in the wake of Sym’s success, nominees included Nobel-prize winning scientist Sir Alexander Fleming, novelist Evelyn Waugh, music hall entertainer Jimmy Logan, and politician and spiritual leader, Sir Sultan Muhammed Shah, Aga Khan III. Also on the ballot was Lallans poet Sydney Goodsir Smith, who had come to prominence three years earlier through his collection Under the Eildon Tree, one of the major works of the Scottish Literary Renaissance. 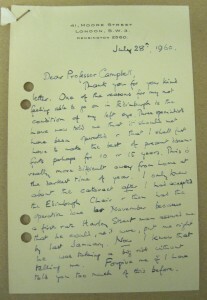 Edinburgh University Archives have recently purchased a copy of Smith’s campaign leaflet, adding to our major collection of Smith papers (Coll-497). During my short and somewhat hectic time as a medical student here, I must have been inoculated with the bug of not exactly ‘study’ so much as just ‘being a student’, for I seem to have remained a student, of one thing or another, ever since. 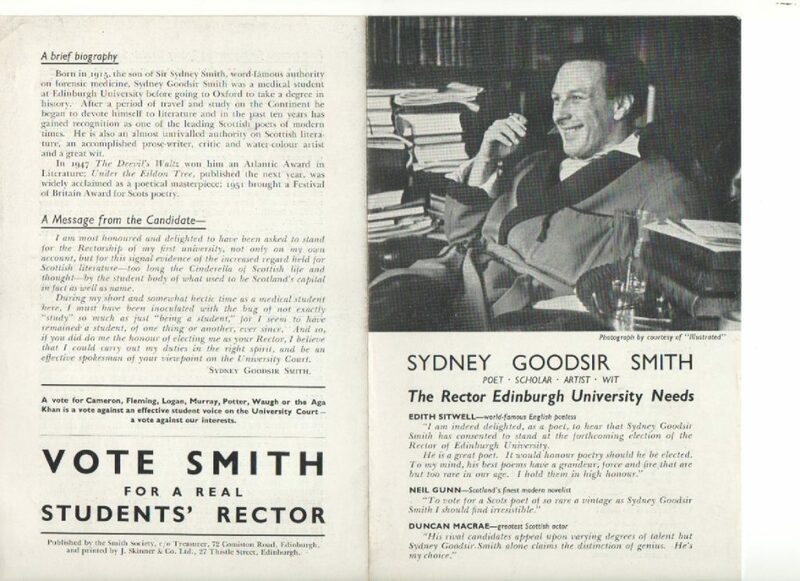 Smith thus presents himself as ‘a real student’s rector’, who, unlike his ageing and out-of-touch rivals, will provide an ‘effective student voice’ on the University Court. There is a second strand to his campaign, however, which voters may have struggled to reconcile with his stance as a spokesman for student interests. 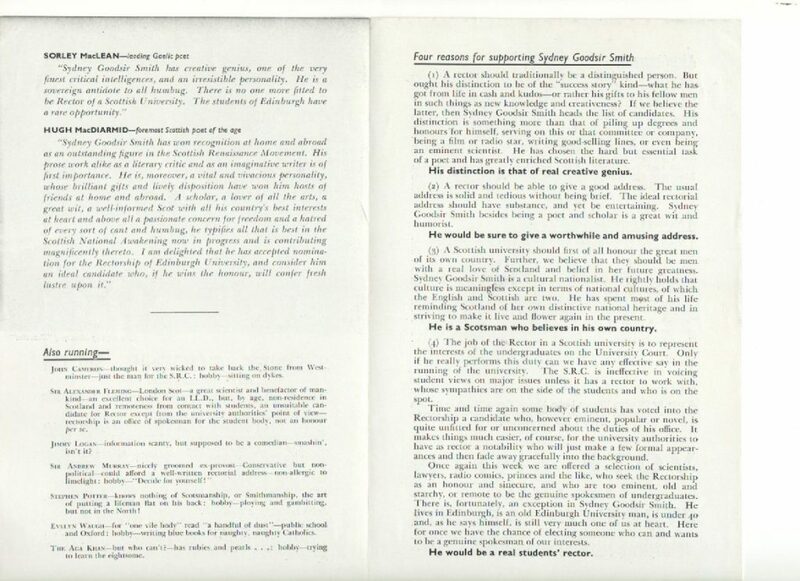 The leaflet, in fact, foregrounds Smith’s literary credentials. The cover photo portrays Smith in his study, resplendent in a smoking gown, and surrounded by tottering piles of books. Beneath the caption ‘Sydney Goodsir Smith: Poet, Scholar, Artist, Wit’ are endorsements from major literary figures of the day, Edith Sitwell, Neil M. Gunn, Duncan Macrae, Sorley Maclean, and Hugh MacDiarmid. Conspicuously, the least political endorsements are placed first. 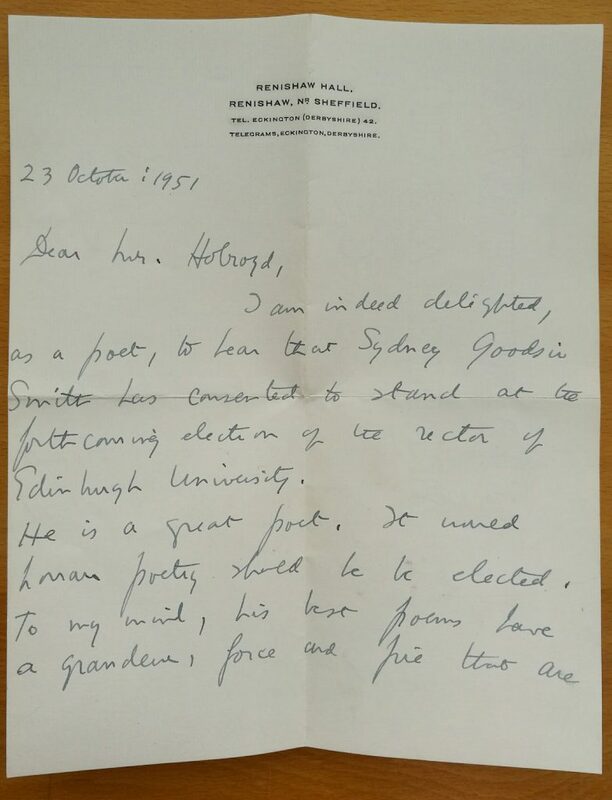 Sitwell claims that ‘it would honour poetry should [Smith] be elected’, Gunn declares that ‘to vote for a Scots poet of so rare a vintage as Sydney Goodsir Smith I should find irresistible’. For actor Duncan Macrae, Smith is alone among the candidates in possessing ‘the distinction of genius’. Maclean too credits Smith with ‘creative genius’ along with an ‘irresistible personality’ and a place among ‘the very finest critical intelligences’. A scholar, a lover of all the arts, a great wit, a well-informed Scot with all his country’s best interests at heart and above all a passionate concern for freedom and hatred of every sort of cant or humbug, he typifies all that is best in the Scottish National Awakening now in progress and is contributing magnificently thereto. 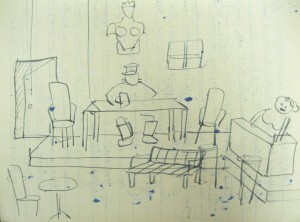 His distinction is that of real creative genius. He would be sure to give a worthwhile and amusing address. He is a Scotsman who believes in his own country. He would be a real students’ rector. In places, the leaflet is a little self-contradictory. Students are asked to vote for Smith because ‘a Scottish university should first of all honour the great men of its own country’. They should not vote for Fleming, however, because he may be ‘a great scientist and benefactor of mankind’ but the ‘rectorship is an office of spokesman for the student body, not an honour per se‘. Perhaps, in fact, the strongest claim that emerges from the leaflet is the likelihood of Smith delivering a colourful rectorial address. His credentials as ‘wit and humorist’ are illustrated in a series of put-downs of rival candidates. 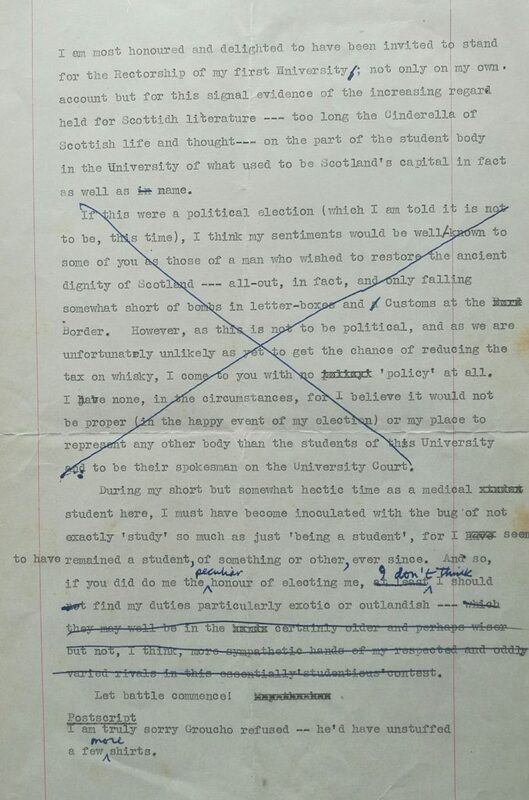 Particularly acerbic barbs are directed at Jimmy Logan (‘information scanty but supposed to be a comedian’), politician Sir Andrew Murray (‘nicely groomed ex-provost … non-allergic to limelight’), Evelyn Waugh (‘hobby – writing blue books for naughty, naught Catholics’), and the Aga Khan (‘but who can’t?’). 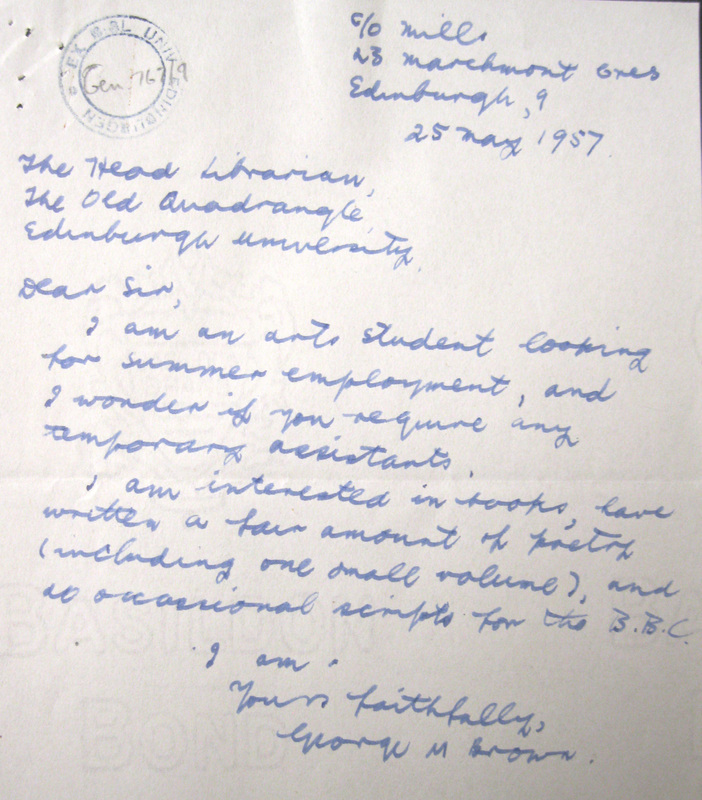 Since acquiring the leaflet, we have discovered that another recent purchase, the archives of the Edinburgh student literary magazine The Jabberwock (Coll-1611), contains a draft version of Smith’s ‘Message from the Candidate’, together with the original manuscripts of the endorsements by Hugh MacDiarmid and Edith Sitwell. 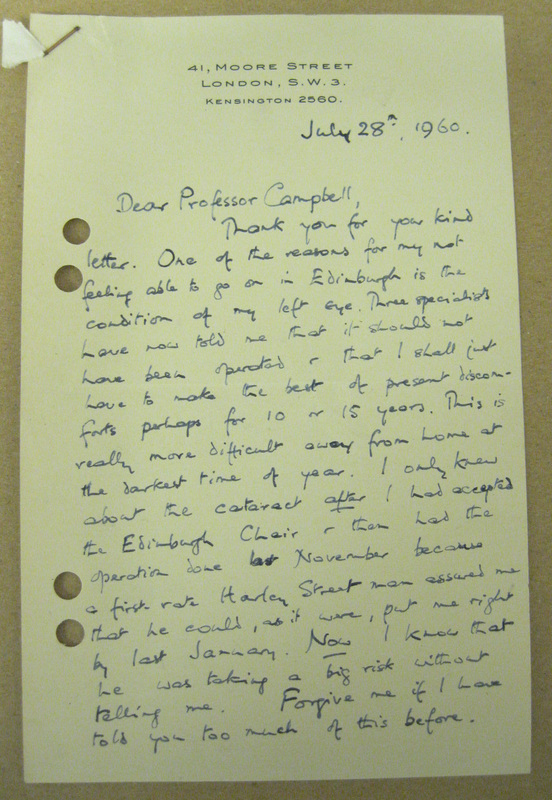 The Jabberwock’s editor Ian Holroyd evidently worked as Smith’s campaign manager, and the archive also contains a letter from veteran Scottish writer Compton Mackenzie, regretting that he cannot endorse Smith’s candidature, as he has been approached by two other candidates with equal claims on his support. If this were a political election (which I am told it is not to be, this time), I think my sentiments would be well-known to some of you as those of a man who wished to restore the ancient dignity of Scotland – all-out, in fact, and only falling somewhat short of bombs in letter-boxes and Customs at the Border. However, as this is not to be political, and as we are unfortunately unlikely as yet to get the chance of reducing the tax on whisky, I come to you with no ‘policy’ at all. I have none, in the circumstances, for I believe it would not be proper (in the happy event of my election) or my place to represent any other body than the students of this University and to be their spokesman on the University Court. Was it the hints of political extremism, the allusion to Smith’s drinking habits, or the cheery admission of having no policy, that most alarmed Smith’s campaign manager? Also deleted is the postscript ‘I am truly sorry Groucho refused – he’d have unstuffed a few more shirts’. Groucho Marx had, in fact, been asked to stand as a rectorial candidate, but sadly declined. 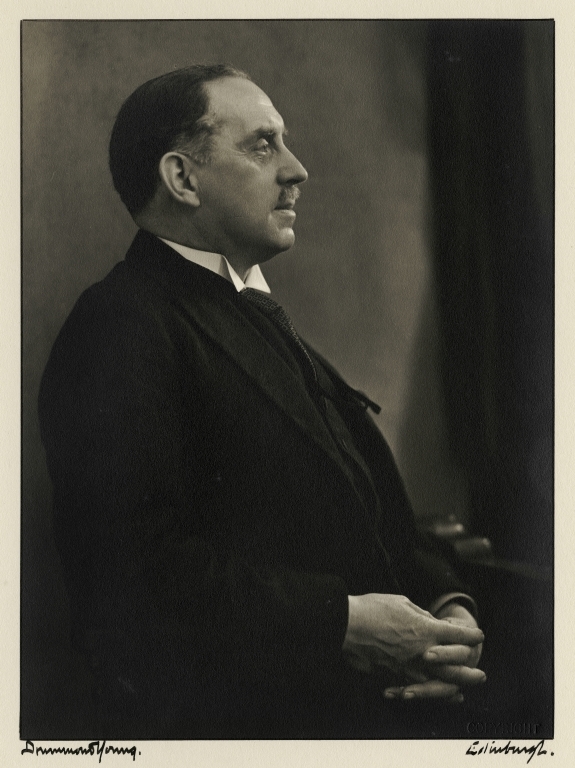 For more on the 1951 Rectorial campaign, see Donald Wintergill, The Rectors of the University of Edinburgh 1859-2000 (Edinburgh: Dunedin Academic Press, 2005), pp. 127-35. Although Smith was never to stand again, his father Sir Sydney Smith won the next Rectorial election in 1954. This entry was posted in Collections, Library on 30/08/2017 by pbarnaby. 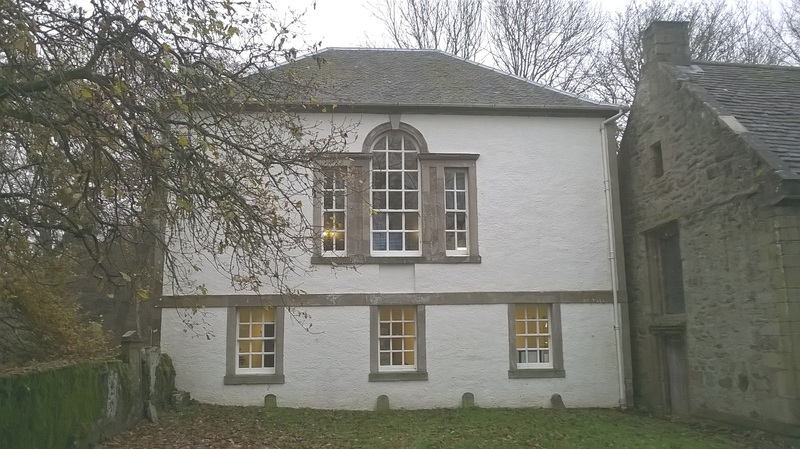 Last Saturday, I was at the wonderful Library of Innerpeffray, Scotland’s oldest lending library (founded ca. 1680) for ‘Connected Collections’, a workshop organised by Jennifer Barnes and Chris Murray of the University of Dundee. 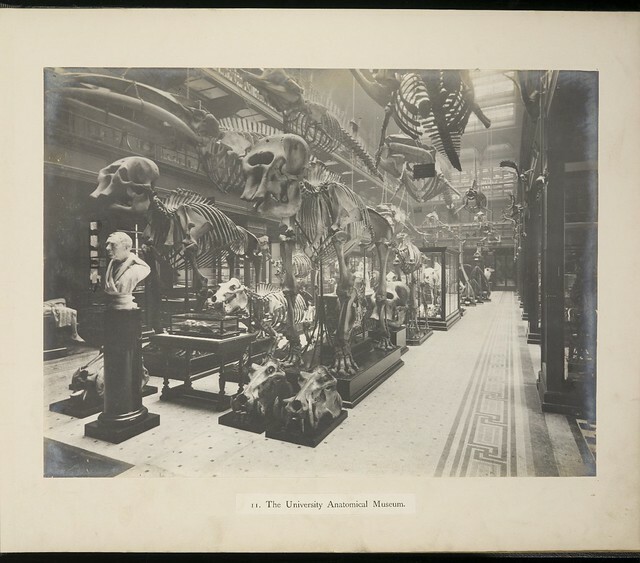 This was designed as a forum for academics, archivists, library and museum professionals, and students to discuss the promotion of creative collections at Scottish universities and work towards potential partnerships and research bids. After my opening talk on ‘Widening Access to Creative Collections at Edinburgh University’, Neil Curtis (Head of Museums, Aberdeen) gave an historical account of collecting and cataloguing policies over the 18th and 19th centuries noting how changing curatorial approaches repurposed and recombined Aberdeen University’s collections, sometimes creating hybrid objects. He stressed too the role of Scottish universities as combined national institutions, rather than regional entities serving only their immediate area. Karl Magee (University Archivist, University of Stirling) introduced the archive of Stirling-born film-maker Norman McLaren and discussed, in particular, the relationship forged between the University Archives and the Stirling Smith Art Gallery and Museum, culminating in the exhibition ‘A Dream of Stirling: Norman McLaren’s Scottish Dawn’. John Izod (Communications, Media and Culture, Stirling University) told the fascinating tale of Lindsay Anderson’s documentary of Wham!’s 1985 China tour, the first visit to that country by a western pop group. 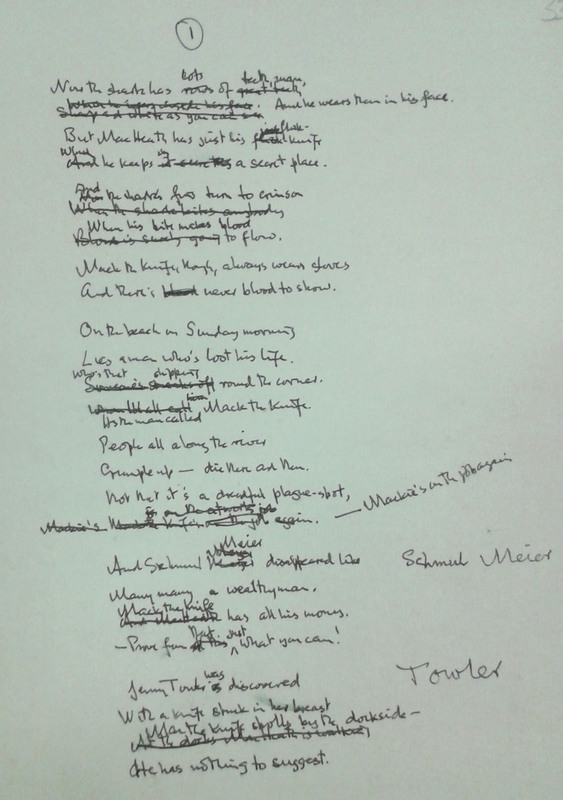 Anderson’s radically different first version, rejected by the group’s management, is in Stirling University’s Lindsay Anderson Archive. Julie Gardham (Senior Assistant Librarian, Special Collections, University of Glasgow) presented a number of innovative ways of promoting arts and humanities collections, including using archives as inspirational materials for creative writing workshops, pitching under-used and uncatalogued collections at potential researchers at evening receptions, and running a student blogathon, with prizes for the best and most liked posts for items on Special Collections and Archives material. 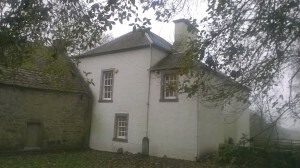 Gerard Carruthers (Francis Hutcheson Chair of Scottish Literature, University of Glasgow) argued that there was a need for a concerted effort to catalogue and explore 18th– and 19th-century poetry archives in Glasgow and the West of Scotland. This was material that had been neglected due to the prevailing misconception that Scottish poetry had descended into sentimental tartanry after Burns. 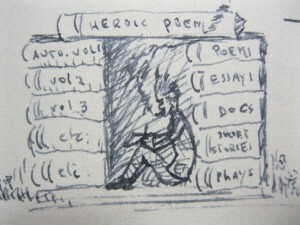 He wished to see a project ‘Scottish Political Poetry and Song, 1832-1918’ researching material in newspapers and periodicals to create an alternative print cultural history. Caroline Brown (Deputy Archivist, University of Dundee), discussed her university’s promotion of embedded archival teaching, including the award of a prize for the best piece of work using archival materials. 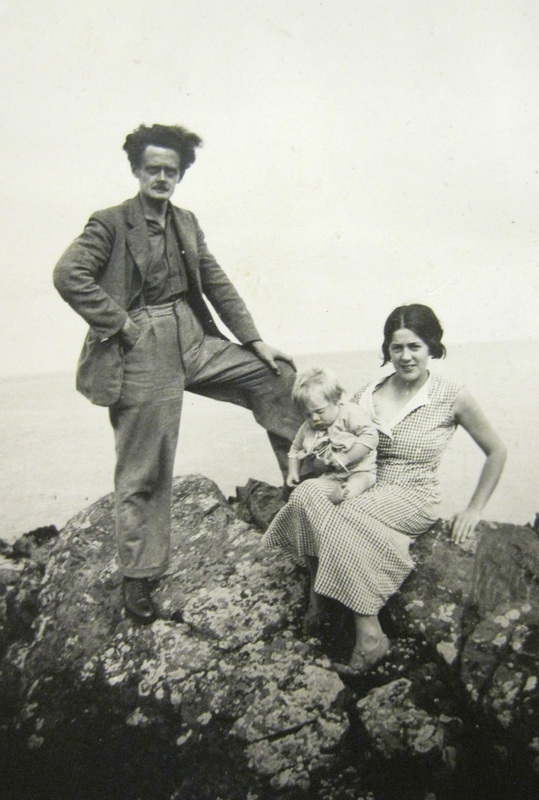 She placed particular stress on oral history projects involving Dundee’s jute mills, the publisher D. C. Thomson, and patients and staff at a hospital for people with a learning disability. Chris Murray (Dundee) discussed the use of archives in Comics Studies courses at Dundee University. These were largely created through building up close relationships with individual comic artists and publishers, many of whom regularly visited Dundee to give talks to the students. 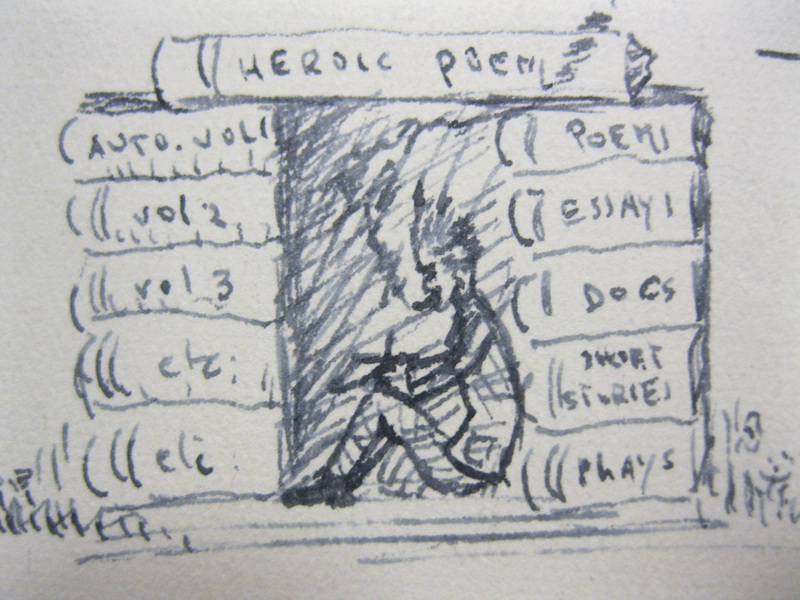 Archival materials were also used to inspire students to create their own comics. Dr Murray noted the difficulty in using some recent materials for teaching and research, due to donators’ concerns that materials might be uploaded to the internet. Finally Brian Hoyle (English and Film Studies, Dundee) introduced Dundee University’s recently acquired archive of the Scottish novelist and screenwriter Alan Sharp, and discussed his interest in building an archive of unfilmed cinema scripts (of which there were many first-rate examples in the Sharp Archive). The day ended with a round-table discussion which gave student delegates a chance to express their own views on the efforts of libraries, archives, and museums to engage with them. A common theme was a desire for easier and more uniform access to collections in institutions other than the student’s own. 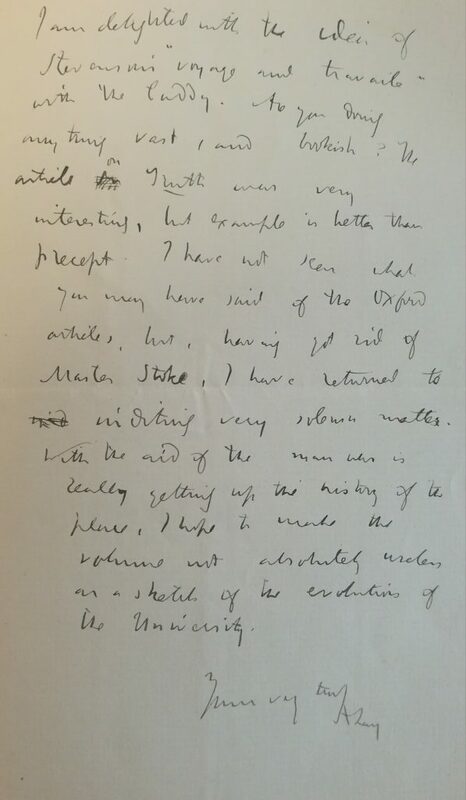 Archivists also expressed concerns that universities were no longer training students in the skills required (Latin, palaeography) to decipher archival materials. The day provided an excellent opportunity for forging contacts between academics, library and archive professionals, and students working with creative collections. It was also an invaluable platform for library and archives staff to exchange ideas on outreach and widening participation. 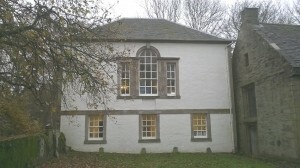 It is to be hoped that future ‘Connected Collections’ workshops will be organized to build on the relationships established at Innerpeffray.